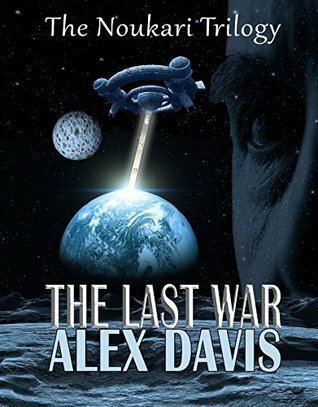 Alex Davis’ The Last War sets out to be intriguing soft sci-fi. Rather than showing off galactic rebellions, blaster bolts and soaring spacecraft, Davis uses the extra-terrestrial to look at questions of faith, matters of religion and personal understanding, and how these things impact on a new society, at both a personal and macro level. Exploring these issues are the Noukari, a species who seem to have sprung out of the ground of their environment overnight. This, it turns out, isn’t far from the truth – the opening of the book indicates that the Noukari are a people specifically created by an advanced civilisation, for some as yet unspecified purpose. The Noukari are baffled by their world, and their place in it, and, at least at the start of the text, busy setting up the means to sustain themselves, rather than indulging in intellectual pursuits. Davis looks at the move of the Noukari into the swampy waters of Deism, and a parallel adoption of rationalism. Funnily enough, there’s not a lot of information about the world, here – there’s a forest, and a village which seems to be slowly turning into a town, but the details of the world outside those bounds are, to the characters and us, an unknown. 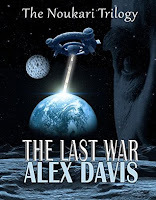 Still, Davis’ world comes alive in the dialogue of the characters; the mundane nature of their locale is contrasted with the vivid nature of the intellectual worlds they inhabit. The characters – well, there’s some good stuff here. There’s the individual who takes up the mantle of seeing the creators of the Noukari as gods. Believing that this is the purpose of his people, he sets out to begin a process of worship, and slowly moves through more practical matters like defining doctrine and constructing a place of worship. Then there’s his critics – a group of squabbling, sceptical, cautious, and occasionally seemingly murderous individuals, They’re not as united as the ever increasing number of Noukari that see their creators as gods, but they seem to have a broader base of support, and a degree of diversity. Still, as characters, there’s some missed opportunities – there’s times where characters reveal their thoughts through dialogue and descriptive action, but I would have killed for more time spent with each individual and their internal monologue – trying to get a sense of what drove them. There’s some effort to explain this, but I do think each of the characters could have used more introspection and a bit more fleshing out. That said, they all serve well as drivers of the plot. Oddly enough, it’s difficult to describe exactly what happens, at least without major spoilers. But it’s a relatively sedate journey of discovery, at least at the start, as the Noukari start asking questions about who they are, and how they define themselves in the universe. Almost inevitably, there’s a move toward conflict which begins to accelerate into an inevitability – as those who seek to worship their creators meet those with a more concrete world-view. It’s nice to see a degree of moral complexity here – those who act on both sides may be acting for good and bad reasons, out of rage, or a genuine desire to help their people in aggregate. The conclusion is, perhaps, a tad abrupt, but I’m hoping to see more elaboration in any later volumes of the series. It’s a fairly slow paced, thoughtful text in the main, with occasional blurs of action to break things up a little. It takes a while to digest, but is certainly a rewarding read. On which note, we can ask the question of if it’s worth reading – and I’d say yes. It’s not a space opera, but something with a more pensive, curious narrative stream behind it. I had to be in the right state of mind to pick it up initially, but it had a great many interesting ideas to try and put across – mostly successfully – and the attempt made for an enjoyable read.